The Buland Darwaza also known as Gate of Magnificence and the loft gateway was built by the great Mughal emperor Akbar in 1601 A.D. commemoration of his victory over Khandesh and Ahmednagar in Southern India. 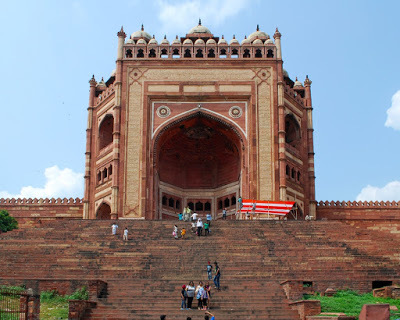 The Buland Darwaza is located in the town of Fatehpur Sikri in Agra in the Indian state Uttar Pradesh. How to Reach by Air: Agra airport is the closest airport about 45 km away from the Buland Darwaza Fatehpur Sikri. How to Reach by Rail : Fatehpur Sikri Railway Station is the closest railway station about 0.7 km away from the Buland Darwaza. It is connected with agra and all mejor places in India. How to Reach by Road : Excellent road network in Fatehpur Sikri and Agra so one can easily go through the road to Buland Darwaza Fatehpur Sikri. The Buland Darwaza is Standing on the highest point of the ridge, it is 40.84 m high and was built on a platform that was 13.52 m high. It is a fine example of Islamic architecture and it is semi octagonal in plan and two smaller triple-storeyed wings on either side. An architectural beauty, the Buland Darwaza is made with red and buff sandstone, along with carvings and inlaying of black and white marble plus towers above the courtyard of the mosque situated inside. Buland Darwaza, the colossal triumphal arch, was built in 1575 on the southern wall of the courtyard. It celebrates Akbar's conquest of Gujarat. Visitors to the Gate will find that up to several feet beyond human reach, the door is covered with horseshoes of other draft cattle. Buland Darwaza has a very famous inscription written on it. This inscription is actually a quote attributed to Jesus Christ, who is revered equally by both Christians as well as Muslims. The roof of Buland Darwaza has thirteen smaller domed kiosks. Apart from that, there is a stylized battlement and a number of small towers. 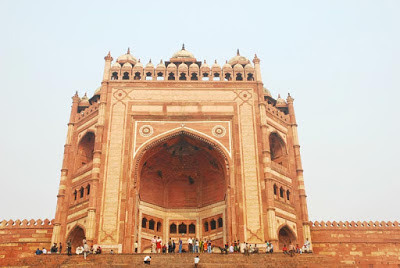 A massive 180 feet tall gate of red sandstone that is the south entrance to a complex of many buildings. Inside there is a mosque and the grave of Salim Chishti made of red stone very good attractiob for photographers. This is a great place for astronomy or science enthusiacsts. 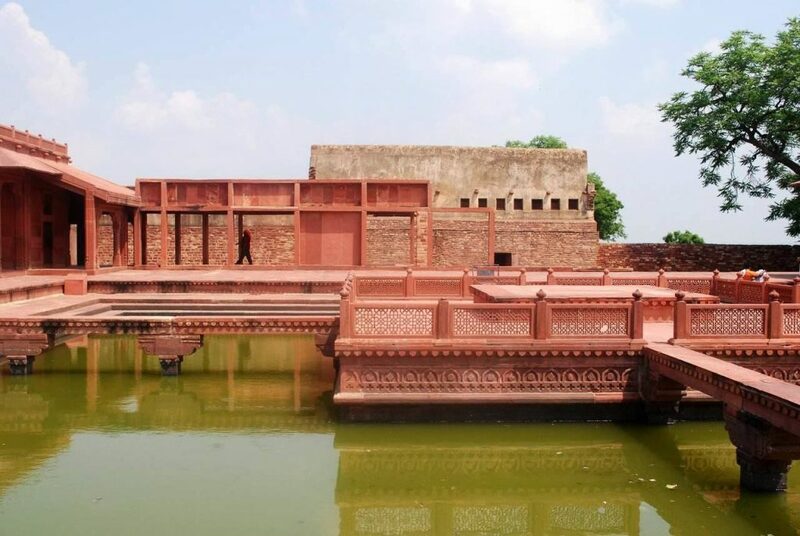 The complex is built using red stone and houses Salim Chisti's dargah which is built with white marbel. The architecture of this centuries old gateway gives you ample opportunities of clicking pictures. It is the most Islamic structure in Buland Darwaza and has inscriptions from the Quran on its front and pillars and chattris on its height. As per its name Buland Darwaja is a largest entry gate of world. 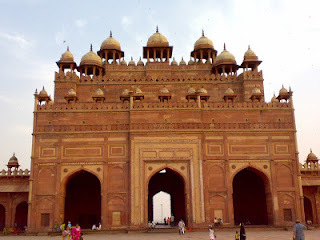 Due to great example of Hindu or Muslim architecture it’s also called gate of magnificence. The entry fee is Rs. 10 for Indians and the citizens of the SAARC nations, and Rs. 750 for foreign tourists. 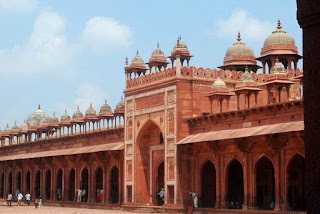 The ticket also includes entry to Fatehpur Sikri. If you have purchased the convoluted ADA ticket for ₨ 500 then you can visit monuments of Agra Fort, Itimadi-ud-daula, Akbar’s Tomb, Sikandara and Fatehpur Sikri. ➤Entry Fee For Indian Visitors: Rs. 10 per head. Panch Mahal, Diwan-I-Khas, Jodhabai Palace also known as Mariam-uz-Zamani Palace, Tomb of Sheikh Salim Chisti, Jama Masjid, Diwan-I-Aam, Khwabgah, Hiran Minar, Lotus Throne are the main attractions of Fatehpur Sikri very closed from Buland Darwaza. 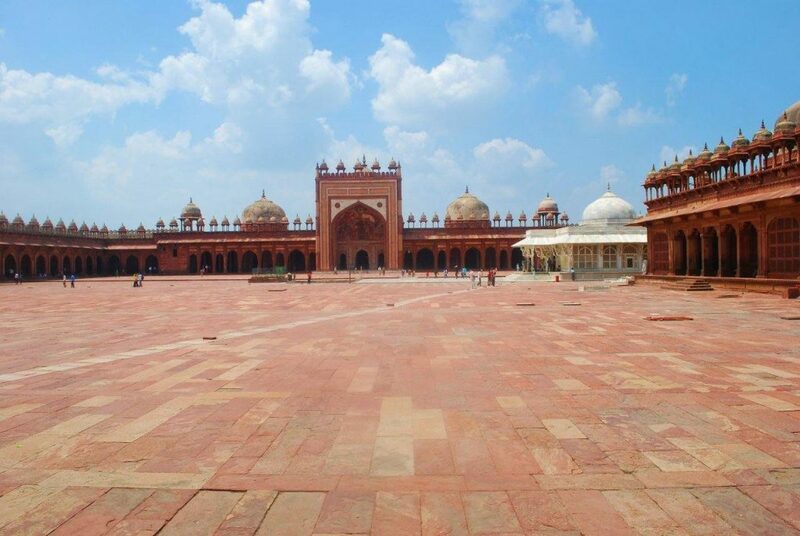 You can also see the great akbar monuments in Fatehpur Sikri. At Agra which is 45 Kilometers from Fatehpur Sikri you can see The Taj Mahal which is wonder of the world, also Agra fort is best tourist attractions that you never missed. 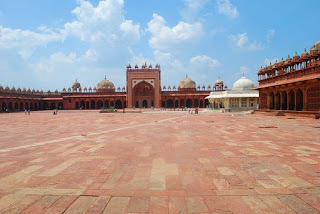 Itmad-ud-Daulah Tomb, Mankameshwar Temple,Ram Bagh,Swami Bagh Samadhi, Sheesh Mahal are other popular Tourist Attractions closed from Buland Darwaza Fatehpur Sikri. 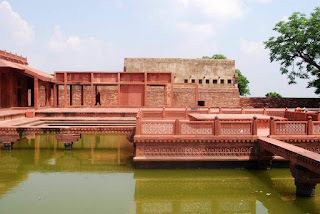 Vrindavan, Gokul, Mathura are also very closed from Fatehpur Sikri other must see places.